I am riding home from the farmer’s market when I see a raven flying toward me with a mouthful of white. I stop to watch. He lands in a fan palm beside the bike path. I wish I had my binoculars. I want to know what he’s holding in his beak. When I first saw him, I was afraid he had a bird, but now I don’t think so. It looks like a huge clump of cotton but less dense, a shock of fluffy white against the smooth shiny black of him. I wait. I think he will put this big prize in his nest, but he only sits there. He makes those smooth guttural sounds I love so much, and another raven answers. I look over and see her sitting two trees down, matching white stuff in her mouth. On the first palm, I see a spot that juts out, and I think it might be a nest. I keep waiting. Then I realize I’ve interrupted them. I apologize and ride away. For a moment, I cry—because I am the intruder, because they are afraid of my kind. Later, I hope I didn’t dim the glory of their bright snowy find. I am holding a bag of lemons. Should I buy one bag or two? The farmer is describing the cherimoyas to another customer. “They’re creamy like a custard,” he says. “They taste like vanilla and coconut.” I remember seeing them in Mexico, but I can’t remember if I ever ate one. I like the odd cactus and reptile look of them. I read the sign—it says $6 per pound. My mind must balk because it plays tricks with that. My lemons are $5 for a bag of nine. I have already counted. I think, oh, the cherimoyas are really cheap. They must not be very popular in this country. My mind is thinking they are six for a dollar. I choose one that is not yet ripe, select five tangerines, pay, too, for my lemons. 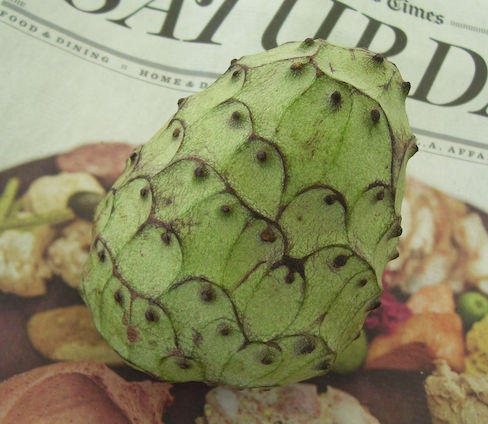 After, I find out the cherimoya cost $3.40. Now it is sitting on the kitchen counter, waiting to ripen. I don’t know whether to hope I love it or hate it, though hating it would be easiest, I think. If I love it, I will have to buy more. It feels good to have my notebook propped against my thighs again, my bare feet on the curved edge of the footstool. Yesterday I felt awkward, clumsy with the pen in my hand. Today it feels familiar, comforting, like finding an old sweater at the bottom of the drawer. I thought I’d given it to Revivals, I think, and pull it on against the chill of a late evening. It has been too long, it seems, too long since I felt like who I am inside it, the old friend who brings you back to center. It hasn’t been that many days since I’ve written, but the days have been long and full. Even when I wanted to write—and I wanted to, bringing my notebook out to the patio table in the mornings, moving it to the edge of the couch in the late afternoons thinking maybe I can write that evening—I didn’t find a place to fit it in. The days have been so busy it feels like months have passed instead of weeks. But I am writing now, and I realize I love the act of writing itself, moving the pen across the page. I like pausing, looking up in the middle of my dreamy thoughts. Two doves and one house finch in the big tray feeder, wary I might decide to stand up again at any moment (human that I am). Sable disappearing beneath the honeysuckle. I love the way writing makes me feel, as if putting words on the page is bringing me more fully into the world again, more a part of life in our courtyard garden. We have smog today. I can see it from where I sit, a thick veil across the mountains. I hear the noise of traffic, too. But there is the quiet pecking of the birds, the scratch of my pen, the soft sound my hand makes moving on the page. It feels good to be here writing, good to be back. Last week I had an aha moment. It dawned on me the challenges I’ve been having with my work are the universe’s way of helping me. So, my aha, my belated realization, was also a “Duh!” moment. I knew this, right? I’ve known this for years, haven’t I? I pray for help often, but I never ask for trials. I don’t say, “Please send me some really hard thing so I can learn and grow.” I ask for help—in healing, in changing—as though the powers that be might reach down, brush me with a stroke of feathers. Voilà. I am a new person. I forget I am required to do my share. I forget that healing, that changing, can be hard work. I’ve asked for help, for guidance in getting through a troubled time. And I never doubt I am receiving that help. But somehow I missed the whole part about how these challenges at work are the help. I forgot I asked for this. The trouble I am having is the answer to prayer. “Duh,” I say out loud. Sable’s ear twitches at the sound of my voice. His expression remains deadpan. And here I thought you were smarter than that, he thinks at me. “Duh,” I say again just for fun. But I am smiling now. This is quite a week we are in. I’d done my own marveling over it, staring at the wall calendar Auntie Gardi gave me for Christmas. Then one of my favorite astrologers pointed it out, too. Valentine’s Day, Margi Gras (Fat Tuesday), Ash Wednesday (the beginning of Lent), the Chinese New Year (The Year of the Goat) and the new moon, all within just six days. How can it be anything but auspicious to have all these happenings coinciding like this? It makes me glad I am almost through my crazy hectic stretch of work. I may be too tired to appreciate these alignments with the proper fervor, but I can feel the forward movement in them, the hope and the promise of them. Harbingers, I believe, of good things coming. I know I don’t do well without taking days off, days where I don’t even turn on the computer. I have colleagues who think nothing of working seven days a week, who seem to do it by choice. But I have to walk away from it, shed the cords tying me to my students, to faculty, be apart from it all in order to stay sane, stay whole. Still, I am no stranger to long stretches without time off, and when I added the new piece of my job I agreed to working seven days through these three periods, about 15 or maybe 17 weeks all told per academic year. My mind always wants to do the math on that, as if to reassure myself several weeks remain untouched. (52 minus 15 = 37. Whew.) Right now, Day 44, this seventh week of no days off feels like it’s been a year already. My perspective is skewed, lost, and a bit of me, too, I am pretty sure. Still, I think I’ve navigated these weeks better than I’ve ever been able to before. The cats have only suffered a little loss of attention, I think, and I’ve been less patient with Mami. (Which is bad, of course, because I’m not very patient to begin with.) But I haven’t yelled at the cats for no reason. There has been no screaming into the phone. And I haven’t ended up in a puddle on the floor, hysterics my only way to release the mounting stress. So, I hold the thought of Friday in my heart, Day 49, my first day off after 48 days. I count myself lucky to have come so far unscathed. And that welling of gratitude seeps through my cracks and eases something inside me, and I know days 45 through 48 will be easier than I first imagined. Ah. I had no idea today was a magic number day until I wrote the date in my notebook: 15.2.2015. I still write the dates the way they’re written in Mexico (and most of the world, I’m guessing) with the day first and then the month. Maggie—a woman I met in Ajijic who split her time between Barbados and Canada but had come to Mexico for dental work—told me once my number based on my name is 15, so now I think of it as lucky. She had changed the spelling of her own name to get a better number. And she hated my beloved 29, based on my birthday. She thought it was a terrible number. I wonder if she would have changed her date of birth, too, if she could? My mind gets to wander while I write. It’s been almost two weeks since I’ve written in my notebook. My pen feels funny in my hand, my writing odd looking and out of practice. I am out of practice in all ways, it seems, knowing nothing but work these past six weeks. Work, and fitting in things between work, like sleeping and eating healthy meals. I’ve done my healing toning almost every day while I do my “morning chores,” but I’ve been doing them in the late afternoon or evening more often than not, having let work sweep me away for most of the day. I’ve begun to do my yoga again, though—a small set of sun salutes, mostly, hiding in the shade of the umbrella in the late mornings. And I’ve been swimming three times now. I’m especially pleased about these last two, about having found a way to reach the doing of them in the midst of this crazed stretch. But now, slowing down to write, I feel exhausted and numb, like my mind is not quite mine anymore.